A parent’s worst nightmare. I almost didn’t even see this on the back of the paper today. It made think if that were my child, how would I feel? What would I be doing? For one thing, I wouldn’t be okay with the ad being placed on the back of the paper. I would want people to notice it immediately, not possibly miss it altogether and toss it in the trash without a thought. I see it in my mind… Imagine with me a silent film, short video clips offering us important glimpses into a sequence of events. A baby girl is born, named, held lovingly in her parents’ arms. That incredible relief and elation on her mother’s face as she gently strokes her daughter’s tiny, soft, pink cheek. Indescribable amazement as that baby wraps her little fingers around her father’s for the first time. Late-night feedings, exhaustion, happiness and peace. Tears, crying, diapers. Tiny little pink outfits. Frills and lace and bows and all of those pretty things that girls can wear. That wondrous night that she finally sleeps through the whole night without waking up or needing anything. Potty training, pull-ups and races to the bathroom. Accidents and potty training songs. Birthdays filled with cakes, ice cream and gifts. Toys and books, play dates and preschool. Can you see a happy family enjoying a picnic together in a park? Imagine the sunlight beaming down on them, glistening in their eyes and hair. The little one running around playing, in between her stops to munch on sandwiches and chips. Maybe that’s where she disappeared. Maybe she was playing and someone snatched her when her parents leaned in for a kiss. Maybe they looked up and she was gone. Panic, fear, agony, trauma. They will never be same. 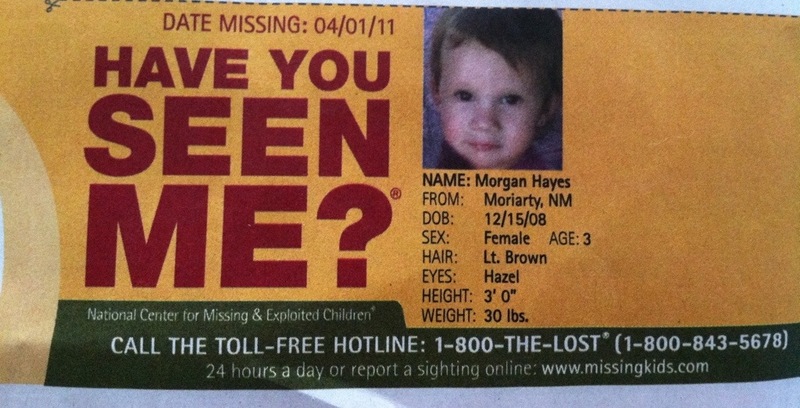 Police, search and rescue teams, missing child ads, news reports. And then, eventually, that moment where life goes on without her. That moment where life becomes the fear and agony and searches. Where everyone else gives up looking, but a few continue to hold hope with the parents. I wonder what happened to Morgan Hayes. I wonder if she’ll ever get home. I wonder what her parents are doing now. I imagine they’re surviving as best they can, living as normally as possible without their daughter. I hope they’ll be okay. Amazing how one little ad on the back of a paper that I almost threw out can make me think so much. Clearly I don’t know the real facts, but no matter what they are, there are people out there hurting for the loss of Morgan, wanting her back, and still searching over a year after her disappearance. It’s overwhelming how many children go missing each year. I always think about them when I see their pictures. I’ll be thinking about Morgan Hayes and her family.